Magic Paintbrush started out in 1979 with a photocopied manual in a zip-lock bag. Originally it was sold with the company name "MP Software", but it was unclear whether the "MP" stood for "Magic Paintbrush", "Mark Pelczarski", or as Mark joked in a SoftSide magazine column, "Magnificent Penguin". Another MP, "Monty Python", had to do with the latter (giant electric penguins and penguins exploding on the "telly"...). But David Lubar, a columnist with Creative Computing magazine at the time, picked up on the "Magnificent Penguin" joke in a review of the software and a new company name was born. Mark thought it was cool that computer stores would trade things like RAM chips and printers for his disks in a zip-lock bag... but he took a side track to New Hampshire as a writer and editor for SoftSide magazine. In 1981 he returned to Illinois and a much more thorough set of graphics utilities was published as The Complete Graphics System from "Co-op Software" (with a penguin in the logo!). Mark had started a mail-order software company called "Micro Co-op", patterning it after the still-flourishing outdoor company REI Co-op (that was back when they were much more of a membership co-op, with only their two original stores in Seattle and Berkeley). The graphics software took off much faster than the mail order company, Micro Co-op was soon sold, and "Co-op Software" became "Penguin Software". 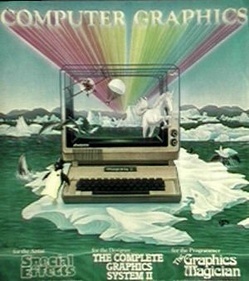 Dave Lubar, the columnist from Creative Computing, and Mark began exchanging ideas and soon another graphics program, Special Effects, was also published in 1981. From David's creative mind came the first software for manipulating existing graphics images, plus the new idea of computer "paintbrushes". ("An idea I wish we'd patented" -MP) In a phone conversation Dave described how it would be neat to be able to do shading effects, create soft edges, and move the "cursor" around like a paintbrush. That same night Mark adapted some of his previous work for putting text anywhere on a graphics screen to this idea by substituting various dithered brush shapes for the text characters and allowing repetition as long as a button was held down. A disk was sent off to Dave the next day with his wishes. These became the "paintbrushes" in Special Effects, and eventually one of the staples of all computer painting programs. Special Effects was soon combined with Complete Graphics System into The Complete Graphics System II. Mark and Dave turned their attention to animation and adventure games. Dave was fascinated with some of the animation effects that people like Bill Budge were able to produce with programs like Raster Blaster, the first great pinball simulation. Mark was intrigued with the graphics Ken and Roberta Williams (Sierra On-Line) produced in their first adventure games, Mystery House and The Wizard and the Princess. Dave figured out some cool animation techniques. Mark figured out how to put graphics from CGS into small amounts of space by creating a tiny vector graphics-like language. In Doug Carlston's house in San Rafael (which doubled as headquarters of Broderbund Software at the time), Mark met Chris Jochumson, who had the idea of how to make animation techniques accessible to novices. Programming Chris' ideas with Dave's animation routines, and then adding his own "compact drawing" program, the result was the third and most successful of the graphics trilogy: The Graphics Magician. This was 1982, and The Graphics Magician would dominate the sales of graphics and utility software for years. It won sales awards in 1984, readership polls in 1985, and the animation and graphics routines would be licensed by almost every software publisher of the time. Mark's creative friend and cohort David Lubar has gone on to many wonderful things, including a very successful career as an award-winning book author.